The UK's premier site for the World's best chainsaw bars and saw chain! You thought chainsaws were just for cutting firewood? With our chainsaw bars, you can become a sculptor - in fact many of our customers are! Look at the gallery and links pages for more information. Of course, a chainsaw is also a working tool, and we also supply anything to do with chainsaws - new saws, saw chains, other parts, and repairs to keep you going. 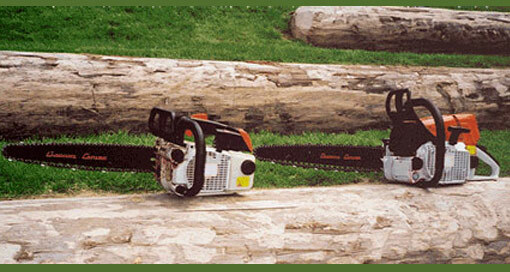 All our chainsaws are run and fully checked before leaving us. We don't just sell you a factory setting chainsaw, instead we tune each chainsaw for maximum power and efficiency as we find that no two saws are identical. In addition, we provide you with full backup, including warranty and repairs and spares, together with any advice you may need. We also sell garden, horticultural and agricultural machinery - from brush cutters, rotavator/cultivators, lawn-mowers to utility vehicles. Please drop into our Tavistock showrooms in Devon, we'd be pleased to see you.